Homeowners who believe their homes need leak location and repairs in Longview, TX need to act quickly before the problem gets worse! Fortunately for them, the experienced professionals at Ledbetter Plumbing know just how to identify and correct these issues! Check out some of our many solutions before calling us today. Do you hear the sound of running water even when your faucets are closed? Is there mildew under your carpets for no apparent reason? Do you feel an unexplained hot area on the floor? All of these could be signs of a slab leak, which can quickly run up your water bill and cause extensive damage to your home. It’s vital that homeowners correct slab leaks as quickly as possible. The Ledbetter Plumbing experts will work diligently during a Slab Leak Detection service. First, we’ll extensively search for the leak in a non-destructive manner before resorting to drastic measures. We know that you’ll want proof of a leak before any intense repairs begin. 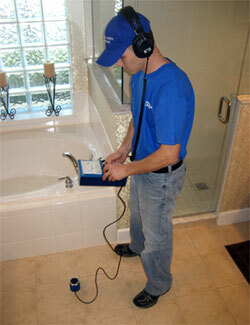 By using cutting-edge electronic amplification equipment, Ledbetter Plumbing will find the cause of the slab leak! Our technical approach helps our customers save money and time on a home repair, as opposed to other companies who prefer to act first and find answers later. The experts at Ledbetter Plumbing have repaired slab leaks for over 20 years, and we know the fastest and most cost effective ways to correct this sort of damage. We have different ways to correct your slab leak, which can range from simple spot repair to fix the leaky plumbing, replacing a pipe (usually in cases of older plumbing) or even placing an epoxy pipe coating on a leaking pipe. The Ledbetter Plumbing team will explain each option to you before repairing your home so that you are included in every step. We’re committed to providing the best customer service so that you’re fully confident in your choice of home repairs. Has the drainage in your plumbing slowed? Are there strange, unaccounted for gurgling noises coming from your toilet or sink? These may be signs of a problem with a sewer line, in which case, you’ll need to act quickly. Whether you have an object stuck in a pipe or the sewer line itself is deteriorating, Ledbetter Plumbing can help! We have advanced methods of detecting problems in sewer lines without resorting to extensive and costly exploratory work. Ledbetter Plumbing might suggest a Video Drain Inspection or another way to find the cause of your sewer line issue. After we’ve located your sewer line leak, repairing it shouldn’t be too difficult! We can perform a pipe relining, where we position a stronger, new pipe to replace the old one simply by pulling it through the line into place. If the entire line needs to be replaced, Ledbetter Plumbing may recommend a pipe bursting, where we’ll remove the existing piping to lay a new system, thus correcting the leak and upgrading your sewer line. Speak with us today to schedule a sewer line visit. If you smell a strange odor, hear a hissing noise or notice dead plants in the yard, you could have a leak in your gas line. Gas line leaks are no joke and they can turn deadly any second. 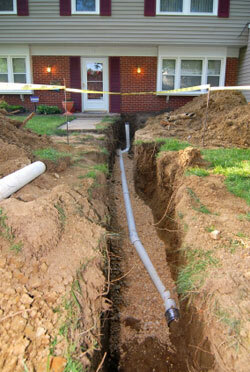 If you have any reason to suspect a leak in your gas lines, call Ledbetter Plumbing immediately. Gas leaks are always a priority to our team. We will do our best to schedule your consultation as soon as possible. Gas fume inhalation is deadly and gas is highly flammable, which is why it’s so imperative to fix immediately. Leave the property immediately without turning anything on or off because a change in the electric pattern can cause damage. Contact Ledbetter Plumbing immediately. 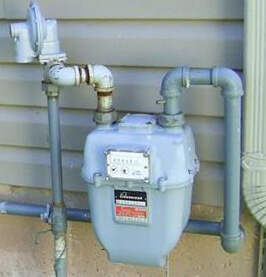 We can locate the leak and then explain your options for gas line repair. Our highly trained technicians can replace a faulty gas line or perform a simply fix depending on the extent of the deterioration. 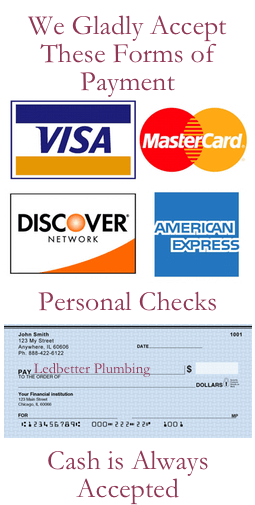 The safety of you and your family is the priority with all work performed by Ledbetter Plumbing. We take our jobs very seriously, especially when it comes to leak detection and repair for slab leak detection, sewer lines and gas lines. Let us help protect your family and your home by calling to schedule an appointment.